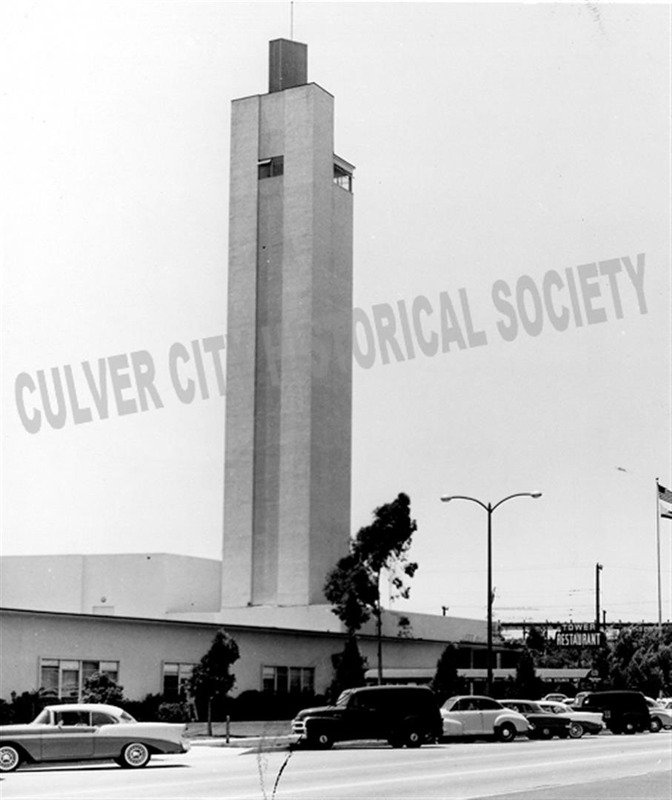 The Culver City Historical Society (CCHS) designated the Veterans Memorial Building as Historic Site #13 at 10am on Saturday, December 10, 2011. Culver City purchased a major portion of this land, known as Exposition Park, in 1938. 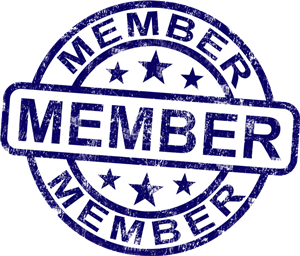 It was officially designated as Veterans Memorial Park on August 8, 1949. Bond financing of $550,000 guaranteed the construction of the Veterans Memorial Building on the corner. 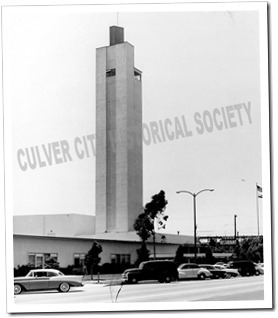 The original plans promised a “recreational building with a stage, restaurant, film museum, playroom, and a large gymnasium.” The “tourist tower” was designed to view “back lot” movie sets at Metro-Goldwyn-Mayer Studios across the street. The cornerstone was laid on April 15, 1950. The VMB was dedicated on March 9, 1951, with Goodwin Knight, Lt. Governor at the time, in attendance. The Gold Star Mothers were guests of honor. This structure, designed to serve the entire community, once included a “Tower Restaurant.” The entry proudly exhibits a growing number of markers, placed to honor and remember veterans who served our country, and who fought for our freedom in many wars. Native Americans traversed this land before it was claimed as a portion of Rancho La Ballona in 1819. The Spanish Period yielded to Mexican control, followed by California Statehood in 1850. This site was part of the original land acquired to incorporate as Culver City in 1917. The VMB was renovated in 1980. At that time, a number of changes occurred, including the rounding of the Garden Room (formerly the Tower Restaurant) wall for a mural and installation of glass to view the adjacent patio. Most notable from the outside was the placement of a sculpture on the Overland/Culver corner, a stainless steel work by artist Natalie Krol, “Filmstrip USA” dedicated in 1981. Rooms within have been renamed to honor our sister cities. City dignitaries, city staff, Culver City residents, Historical Society members, Veterans, students and the public were invited to attend the ceremony.